I've set myself a goal to produce 1000 lbs of potatoes this season, looking for any tips and tricks I can get. The plan is to till with the 149 & #1 tiller, then use the 106 to dig furrows with a Brinly middle buster, plant the furrowed rows at 12" spacing, then cover with bedding discs on the Brinly cultivator bar that I probably just paid too much for on eBay. I have no discs, sweeps, stems, or hardware for the Brinly Cultivator, which should be arriving Monday. Really close to ordering discs and stems from Agri-Supply, and I'd certainly value your opinions and input before I do so. I also need sweeps. Tire cover sweeps for sure, with stems, or S-tines, depending mostly on your suggestions, shared experiences, and dealers. I'd like to do a couple rows of corn, not a whole lot so there's no reason I can't fertilize by hand, but if these sweeps had fertilizer injectors for side dressing I would definitely put them to use. I'd like very much to get something like that all dialed in and functional, should I get the opportunity to expand my garden next year. I till then push the spuds into the soft soil face down for those that are cut then hill. Works great for me and we grow about 300 lbs each year and have plenty left over for seed come spring. 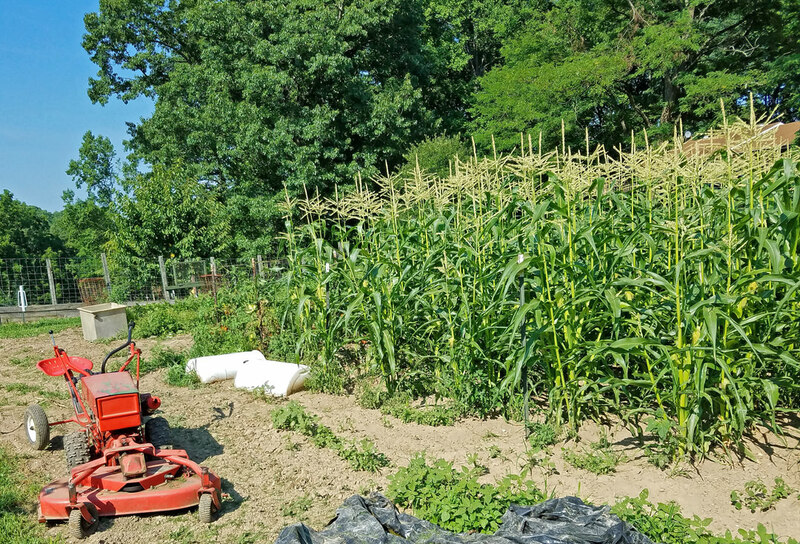 We quit gardening a few years ago, but raised a LOT in years past (over an acre). For most everything we planted in raised bed rows, because that's the type of equipment you have on a tobacco farm. Make sure your tater patch can drain well if you get a LOT of rain. One year where we had it the rows could not drain and the taters rotted---the other end of the rows were great! 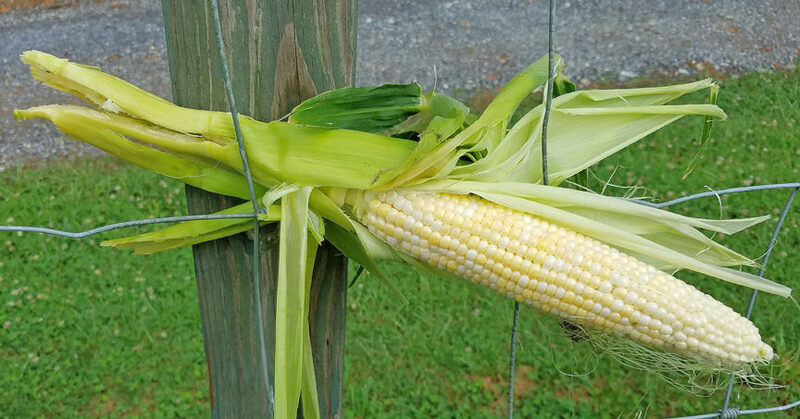 Our favorite corn is Silver Queen--does great here in the Southeast. Others like Golden Queen or Peaches and Cream. Plant the same time as the farmers in your area do--should be reasonably soon. We noticed with late planted sweet corn it tends to get worms, not really an issue with normal planting dates. Regarding fertilizer, I don't know how much to tell you to use--too much can upset your stomach. That said, we planted our sweet corn with a 4 row planter and sprayed liquid nitrogen on it. Probably planted a little thicker than most folks too. Probably should side dress your corn fertilizer and get it at or just below seeding depth. I planted taters in the same spot last year and they did pretty well. I used a rented tiller to make 6 rows that ran up and down the hill, wide enough to mow between on the tractor. 2 rows of taters were successful crops, as was a row of cukes. Everything else wound up deer food, so everything else is going in raised beds inside of an electric fence. This year I've got a 149 and a #1 tiller with an extension, and I'm about a belt and pulley away from breaking ground. I'll be able to plant across the hill, and a whole lot more. I'm on the hunt for the right sweeps and discs to hill 'em, just like your benders probably did. As far as the corn goes, I'm mostly hoping to get the tractor set up to work a small corn field than anything. I may only grow 2 or 3 rows, and I'll plant them by hand if I don't go pick up an Earth Way seeder. It's the side dressing that gets me. I have my Cubs and that's it. If you or anyone else has rigged your cub to side dress, be it liquid or solid, I'd like to see what you did. No real ideas on side dressing unless you go with a tractor such as the Farmall offset series--Cub through 140. Maybe you could cultivate a trench, drop your fertilizer in it and then cover it back up? I do remember using a horse drawn fertilizer distributor. Probably some of the older guys here remember them. Basically it looked like a plow with a hopper big enough to hold 50lb of fertilizer. We bedded the rows with the tractor, then opened them, pulled this down the row, then probably stirred the fertilizer with the rear sweeps on the tractor. Gardening is different when every thing you have is set up for tobacco fields!! Just had a thought, look into a Cole horse drawn corn planter. Here in the Southeast those things are still very popular for gardeners. Guys make a hitch for them and pull them behind the offset series tractors. I think they have fertilizer hoppers on them. Nobody here uses the offset IH tractors for tobacco anymore so we are flooded with those machines for gardening. I would think with some welding you could put one behind a Cadet. Another product that comes to mind would be an old Soda-Flo off a tobacco planter. These were add on attachments for putting out some starter fertilizer when planting with the old Holland transplanters. Pretty sure they have been obsolete for the last 25 years. Just tossing out ideas, best of luck with your corn! Here is a quick search on CL for Cole planters.